The API Manager REST APIs enable you to perform create, read, update, and delete (CRUD) operations on API Manager data. 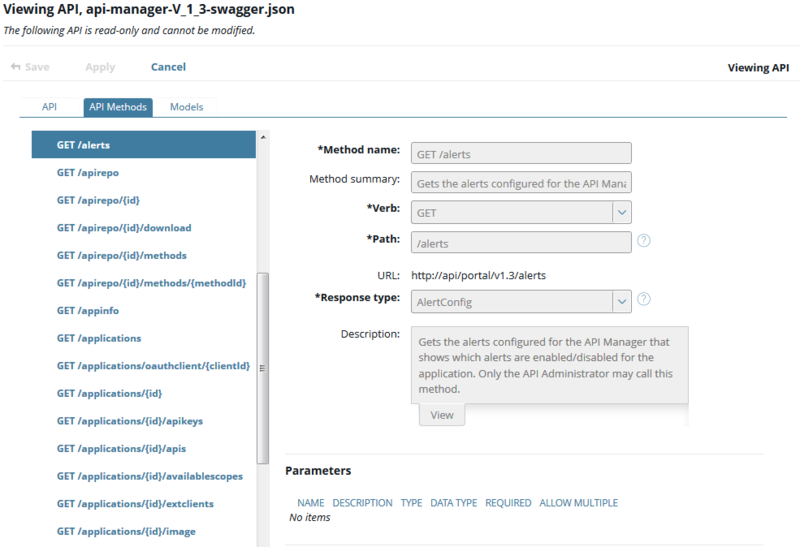 For example, this includes configured APIs, users, organizations, applications, quotas, metrics, alerts and events related to API Manager. Note When viewing REST APIs on the Axway Documentation portal, the consumes field is not displayed if you are using formData type parameters in an API, due to limitations in the Swagger UI version. API Name: Enter a user-friendly name for the API. The default is api-manager-V_1_3-swagger.json. Click Import to import the API Manager API. For more details, see Register REST APIs in API Manager.